Bodybuilding.com has a lot of crazy looking folks on their website, but they also have some seriously healthy recipes that (wait for it)…taste fantastic! 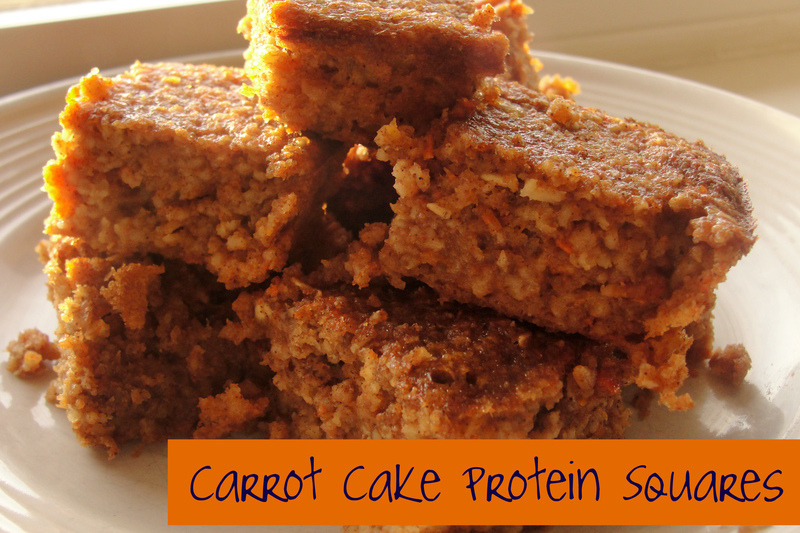 The first time I tried making carrot cake protein bars, I utterly failed. After finding a recipe from inspirational fitness model, Jamie Eason, I thought I’d give this snack just one more try. I am so glad I did! I still have about 80 pounds of Costco carrots in my fridge and plan to make a few batches of these squares to freeze. Jamie suggest you use jarred baby food in place of the carrots, but if you are like me and have an abundance of orange roots at home and very little drive to go to the grocery store again, you can use fresh carrots. Just boil or steam and puree them up in a blender or food processor with some water, as if you were making baby food. I called my brother Matt this morning to ask what he thought of these squares. This is the brother that doesn’t despise my cooking by the way. He said he enjoyed the cinnamon flavor and thought they were good. Translation: make these. Quick story. These squares came fresh out of the oven yesterday, right as we were about ready to head over to my parent’s house, which is about a 15 minute drive away. The kids were tired and we were rushing out, so I just grabbed the pan and a spatula with me into the passenger seat. This was my protein snack and I didn’t want to miss it! When I saw Matt at my parent’s house, I offered him a square. Matt is a personal trainer and loves healthy food (he also loves totally crappy food too). He mentioned his thrill over the new Taco Bell taco with a Dorito shell. Anyhow, I pulled the pan out from the car and stuck a spatula of carrot cake to his hands. He wasn’t exactly expecting the snack to be served this way and ran off to get a napkin. The humor of it all was lost on me until we drove away. Maybe the humor is lost on you too, sorry if that made no sense. So, these have no flour, use only egg whites and taste really, really good! Plus, they hold some protein powder within. Mix flour, whey protein, cinnamon, allspice, nutmeg, baking soda and salt together in a bowl. Mix egg whites, Splenda, baby food carrots and water (optional) in a bowl. Spray glass pyrex dish with non-stick butter spray. Pour ingredients into 8×8 dish. Here’s a video where Jamie Eason will teach you to make these sweet snacks, too!